For the district, see Okara district. For other uses, see Okara (disambiguation). 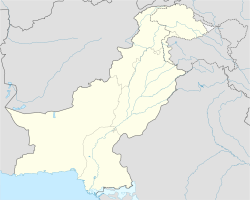 Okara (Punjabi, Urdu: اوکاڑا‎), is the capital city of Okara District in the Punjab province of Pakistan. The name Okara is derived from Okaan, the name of a type of tree. The city is located southwest of the city of Lahore and Faisalabad is 100 km by passing away Ravi River. It is famous for its agriculture-based economy and cotton mills. The nearest major city to Okara is Sahiwal, formerly known as Montgomery. Okara is a relatively new agricultural city; during the period of British rule there was a forest of Okaan where the city has been re-built, and from this the name of the city was derived. During British rule, the area was part of Montgomery District and contained a large saltpeter refinery. A large number of textile mills are located in Okara. The predominantly Muslim population supported the Muslim League and the Pakistan Movement. After the independence of Pakistan in 1947, the Muslim refugees settled in the Okara District. In 1982, the city became the headquarters of the newly created Okara District. Okara has had a railway line since 1892. Okara is famous for its cattle breed known as Sahiwal and a Water buffalo breed known as Niliravi. It is very rich in livestock population and production. Livestock Production Research Institute Bahadar Nagar Farm is a very large government farm near Okara. The farm has a large number of cows, buffalo, bulls (for reproduction), goats and sheep. The majority of the population of Okara are Punjabi speaking Muslims. The main tribes and clans include:Zaidi,Nuqvi,Rizvi,Kaazmi,Gillaani,Kirmaani Muslim Raajpoot Clans as (Toor, Bhutti,Nonaari, Siyal, Wuttoo, Rungurh, Kumyaana etc. ), Shaikh, Lodhi, Khurls, Kumboh, Khaanzaada, Noon Arains and the Jhakhar are prominent. However, the Jut Muslim population is less compared to other communities. The major politician in Okara is Munzoor Ahmed Wuttoo who was the former Minister for Shomaali Ilaaqa Jaat and Azaad Kushmeer of Pakistan, Okara city was established in the nineteenth century by the British Raaj. The city of Okara serves as district and tehsil capital and is itself administratively subdivided into ten Union councils. The city of Okara is renowned in producing of Maize, potato and Dairy products. Okara is known as Pakistan's largest city for production of these commodities. Uni Tech Institute of Management Sciences (UCMT) Karmawala Town Okara. University of Okara is located in Okara. It has two campuses, one is located inside the city near Samadpura and the other one is located on 10 km highway to Lahore. University of Agriculture is also setting down its campus in Okara. This campus is also located on highway to Lahore. Wikivoyage has a travel guide for Okara. ^ Punjab - Imperial Gazetteer of India, v. 20, p. 312.